Many large companies see corporate venture capital (CVC) as a key tool for gaining access to new technologies and getting insight into emerging trends – and hopefully earning a positive financial return while they’re at it. However, a changing financial, technology, and market landscape is creating new challenges for CVCs. Conventional venture capital is retrenching to capital-light software-focused investments and backing away from capital intensive sectors, like healthcare and cleantech, where many CVCs would like to co-invest. Meanwhile, other funding sources like contests, conscious capital, and crowdfunding are growing, and will likely collectively surpass VC soon. Technology development is diversifying and globalizing, meaning that companies have to cast a wider net or risk missing critical innovations. Meanwhile, in the face of macroeconomic uncertainty, the C-suite is pressing strategic functions like CVC to show more concrete and near-term value to the organization. Respondents still are bullish on corporate venturing – and venture capital in general. As we found last year, CVCs expect their programs to grow, with 71% anticipating increased investment activity over the next two years, against just 5% expecting a decrease. What's more, they remain confident in the relevance of both institutional VC and CVC. When asked about the importance of alternative funding sources, VC and CVC easily outpaced any alternatives (see the Figure below). 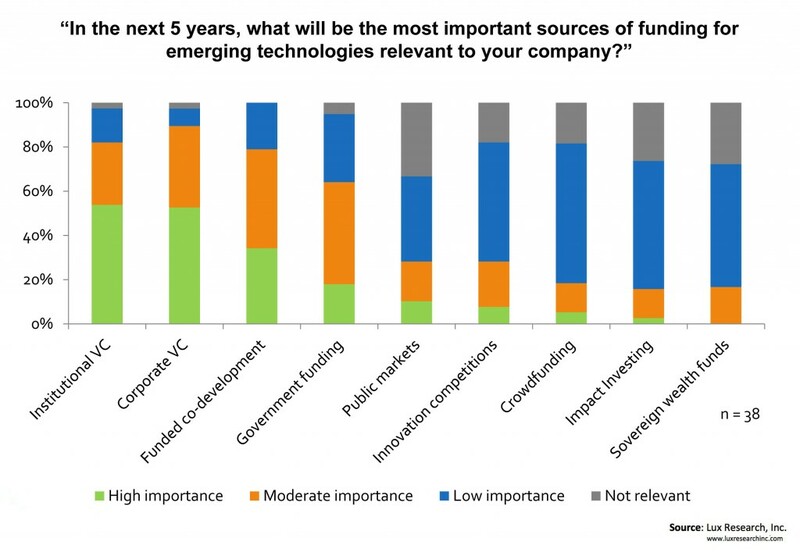 Obviously, this is not an unbiased perspective – and Lux Research has higher expectations for other funding sources relative to (C)VC – but this belief will buoy corporate venturing activity. Expectations for early investment and rapid impact push CVC short-sightedness. CVCs anticipate a range of outcomes for their investments, but expect to see a commercial impact within five years for an estimated 62% of deals. Accordingly, they generally avoid seed investments, with only 14% of respondents saying they often invest at that stage. However, 52% often invest in Series A deals, and 62% in Series B deals, where for many categories – particularly energy and materials – a five-year impact may be ambitious. CVC recognizes the value in patience, but several investors commented on the challenges of maintaining C-level support for a long enough time to show results. One bemoaned his difficulties in "making brave, long-term, strategic investments instead of being an auxiliary part of short-sighted business strategic marketing." Big data, wearables, and advanced materials lead areas of interest. The survey also asked CVCs which of 20 different technologies and markets they thought were going to be their top areas for seeking deals in the coming year. Advanced materials was the leading field, with an average of 3.1 (on a 1 to 5 scale, where 5 represents the highest level of activity), likely due to its broad relevance across many industries. Big data and wearables were next at 2.5 and 2.4 each, respectively, and wearables posted the largest uptick compared to activity last year, when respondents reported just a 1.8 average. Energy storage, water, cloud services, and 3D printing also drew significant interest. Corporate venturing will clearly continue to play an important role in the innovation efforts at large companies, but many investments will be long-term ones in terms of commercial impact. We regularly hear about CVC efforts (as well as tech scouting or open innovation) programs pulled back toward serving the interests of the core business and away from what should be a more natural focus on helping enter new business areas. Top management can't afford to take its eye off the ball of near-term results, so CVC managers will often have to carefully build their value proposition beyond just exits and acquisitions to defend and justify their programs. For more on Lux's research on corporate venturing, contact Michael at michael.holman@luxresearchinc.com.